The Key to Time story arc continues this week with the Doctor (Baker), Romana (Mary Tamm) and K9 arriving on The Pirate Planet. This story ran from 30 September to 21 October, 1978, and was written by Douglas Adams, yes, that Douglas Adams. 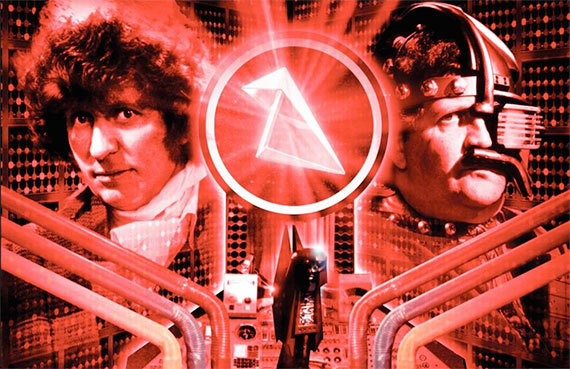 The next piece, the travellers, learn is located on the planet Calufrax, but when the TARDIS attempts to land there, they end up on the planet Zanak instead, where from a mountain base, everything is run by the half-robot Captain (Bruce Purchase) with Mr. Fibuli (Andrew Robertson) serving as his scientific right hand. Perched upon the Captain’s shoulder is a robotic parrot, called Polyphase Avatron, and you just know that before the story’s end, the K9 and the robotic bird will have it out. They just have to. 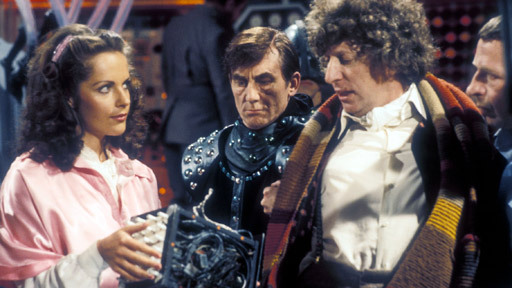 As the Doctor and Romana investigate, she gets a little further gathering information, because as K9 points out, she’s prettier, we learn that the entire planet is flush with riches, and when they appear to be running low, they start mining, deep under the surface and return with new wealth. The Doctor discovers both the fate of Calufrax and the secret of Zanak… the Pirate Planet is hollow, it materializes around other planets, in this case Calufrax, and sends teams down to plunder the planet, returning to Zanak’s surface with the planet’s riches. The Doctor and Romana ally themselves with the Mentiads, and go to work trying to stop the Pirates, but there is another person behind it all, someone who has tried to stop the flow of time, and greedily hold onto the last little bit of life, even if it means the destruction of other planets to do it. This was a fun story, and a viewer could very much tell that it was a Douglas Adams story, there is everything you would expect from his writing, taking the usual stereotypes of a genre, in case the pirate story – parrots, planks, plundering, and giving it a fun twist. There are lots of irreverent moments, and great ideas behind what could be mistaken for a goofy story, and a goofy looking villain… sorry the Captain didn’t feel like much of a threat, but the reveal of the real villain was very cool. They recover the second piece of the Key and continue their journey next week when they encounter The Stones of Blood!